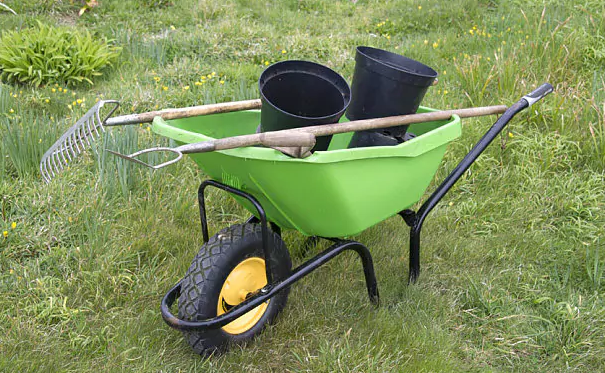 The moment that you consider tinkering in gardening or farming, you are bound to need an excellent wheelbarrow. It will help you move your plants and other items up and down. Whereas in the past, most wheelbarrows looked the same, today it is possible to find a wide range of wheelbarrows. These make gardening easier and more efficient, and which look great as well. Now, when choosing a wheelbarrow, you can consider the size of the barrow. Also think of the positioning and number of wheels, the height of the handles and so much more. Here are ten of the best wheelbarrows for you to choose from. View this week's best deals on the best wheelbarrow! 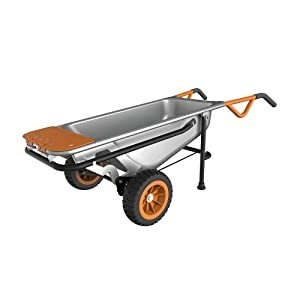 For a wheelbarrow that seems ahead of its time, you should try out the Worx Aerocraft Multifunction Wheelbarrow. It looks modern, and has a patented tray design. It is able to automatically adjust its own center of gravity. This makes it easier to manage any load, up to 300 pounds. This is a wheelbarrow with dual functionality, either as a dolly or cart. It also has a foldout arm at the front, which makes it possible to haul larger items. This wheelbarrow is narrow, making it easy to pass through small spaces with ease. Flat free tires require minimal maintenance. Less lifting due to perfect positioning of tires. The narrow build of this wheelbarrow makes it challenging to carry wider and heavier loads. For a wheelbarrow that is multi-functional, this is the best wheelbarrow for you. The extension that folds out at the front makes it easier to carry bulky items. You can further customize this wheelbarrow by adding a range of accessories to it. For a good deal financially, this is the best wheelbarrow. 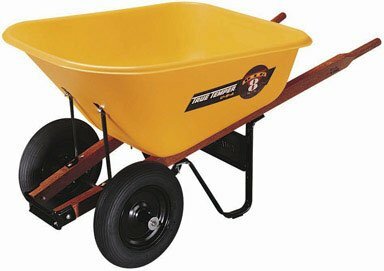 Long lasting and heavy duty build are the primary characteristics of this wheelbarrow from Ames. It features a poly tray that is available in bright yellow, and is light in weight. The handles are made from top quality hardwood. This is the best wheelbarrow in 2016 for contractors. What stands out most about this wheelbarrow is the fact that you can carry so much with it. This comes down to its 8 cu. ft. capacity, and depth. This is the ideal wheelbarrow for some heavy work in the garden. 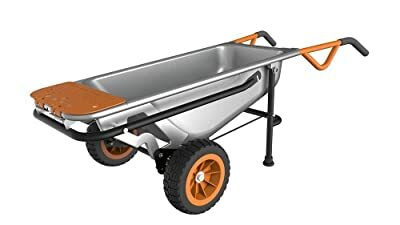 As you are searching for value with your wheelbarrow purchase, you will find that this is the best wheelbarrow for the money. It can stand out to daily demands while carrying heavy loads with ease. If you are looking for the best wheelbarrow for construction, you should choose the Jackson M6T22 wheelbarrow. It is made from rust-resistant steel that can stand the elements. It is also highly durable, ideal for carrying concrete over any type of terrain. It has front H brace which help with its reinforced frame. It also is more stable that traditional wheelbarrows as it features leg shoes. This makes it ideal for heavy lifting and long hauls. This is a wheelbarrow that is excellent for heavy work, as it is built to withstand tough conditions. One cannot fault the quality of this wheelbarrow. It brings together all the traditional features of an excellent wheelbarrow and makes the most of them. If you are starting your small garden, this is the perfect wheelbarrow for you. It is a strong wheelbarrow that handles heavy loads, including gardening as well as construction work. It is durable and doesn’t dent easily, earning its place in the list of the best wheelbarrows of 2016. This wheelbarrow has a dual wheeled design, giving it excellent stability. It looks different from all others due to its large tires. These are 13 inch tube type pneumatic wheels that are easy to inflate. With minimal parts, you will find that it is quite easy to put together. Loop handle ensures easy handling. Lightweight makes it easy to use. Corrosion free material keeps it long lasting. Wheels that need inflating require more maintenance. Color may deteriorate over time. This is a wheelbarrow that has a stunning color which will blend well with your garden. It is an excellent addition for a home garden, and can be used for minor construction jobs as well. This is a modern take on the wheelbarrow. It allows more balance as it has three wheels instead of one. This makes it ideal for anyone who wants to use a wheelbarrow, without heavy lifting. You can easily control it on rough ground. This is the best wheelbarrow for stability. This wheelbarrow has two additional rear wheels, that limit lifting, and maintain balance. There is no need to worry about overturned loads with this wheelbarrow. By design, it is sleek and strong, which is great for heavy lifting. 360 degree spinning design is great for all terrain. This is a versatile wheelbarrow, which can be used for construction as well as in your garden. It’s stand out feature is stability. It is modern in design, and made from the best materials. It is ideal for both pushing and pulling. It is also large enough to carry a variety of items. For the best wheelbarrow for hauling, you should choose the Lifetime 65034 two wheel wheelbarrow. It is very durable and able to lift a load of 550 pounds. Whether you want to haul mulch or gravel, you will find that this wheelbarrow makes it much easier. Where other wheelbarrows are made of metal, this wheelbarrow is made from recycled material. It has a wheel base that is significantly wide, to ensure that there is more stability. This means that tipping is far less likely. Steel frame is weather resistant and powder coated. Easy dumping due to tapered front. Treaded wheels that are heavy duty make it easy to use on all terrain. Difficult to fit through a narrow space. Without proper care, the steel may rust. This is a wheelbarrow that will make any hauling that you need to do much easier than you can imagine. It has been designed to ensure that heavy loads are light to move. The strong build ensures that it will stand the test of time. When it comes to brand names that are known for functional kid’s items, you are sure to see Radio Flyer. 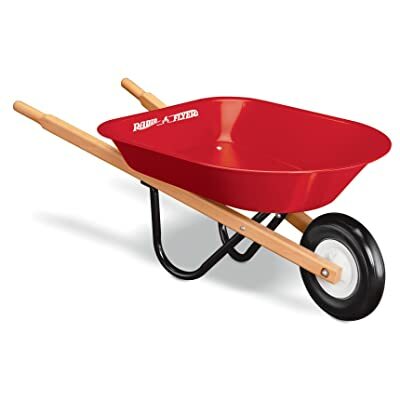 This wheelbarrow lives up to expectations, with its red metallic design and simple wooden handles. It maintains balance and can carry heavy items on its steel undercarriage. This is a kids wheelbarrow that looks excellent, with its wooden handles, steel tray and black and white wheel. In addition to being fully functional, it looks great and is fun. It is the ideal wheelbarrow for kids aged three years or more. The plastic wheel may not last long. The screws do not always line up well. Unable to carry heavy loads safely. Should you be searching for the best wheelbarrow in 2016 for hauling, this is the best choice. At a weight of just over seven pounds, it is perfect for little hands that want to move this toys or flowers around. The wooden handles make it appear like the wheelbarrow from a little child’s fantasy. Many of the wheelbarrows that are available are now made from poly and other materials. When you are looking for something sincerely traditional, then you should choose this all steel wheelbarrow. This is a wheelbarrow that has stood out as a favorite. This wheelbarrow features a heavy duty steel undercarriage. And also has strong steel handles which have been built for comfort. 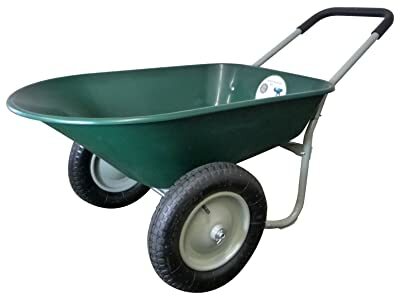 As a wheelbarrow, it is an all-rounder, and is the best wheelbarrow for hauling construction materials, as well as using when in the garden.Others who have purchased this wheelbarrow site it for being of incredible value. A high capacity steel tray of 6 cu. ft.
No worries over a flat tire. 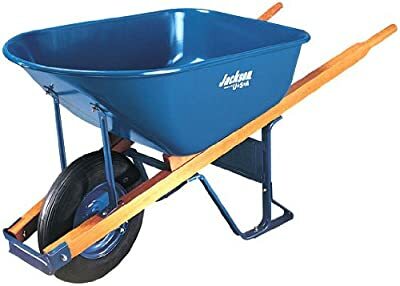 You will find that this is a wheelbarrow that you will be able to use for years, without any issue. Being made from steel, you can be sure that it can carry a range of loads. 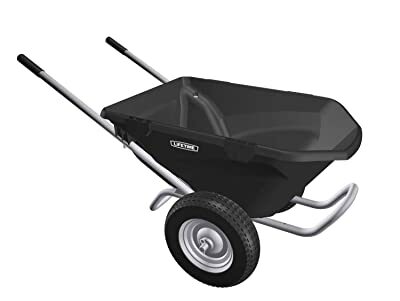 Whether you have heavy duty work, or some light gardening, you will find this wheelbarrow works well. 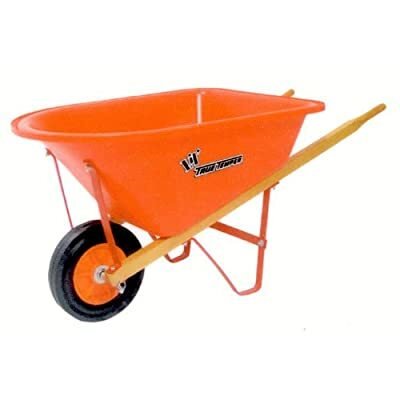 The bright orange color of this wheelbarrow is the first thing that you will notice. It is highly affordable, particularly when you consider all the features that it has. This is a junior size wheelbarrow that children from the age of three and above will find easy to handle. This wheelbarrow is deeper than many others, making it possible to carry more items with ease. It has a poly tray that is corrosion proofed. The handles are made from hardwood which has been sealed for longer life. You will notice that this wheelbarrow is easy to maneuver. A solid rubber tire requires minimal maintenance. Cross brace often not correctly drilled. This wheelbarrow is excellent if you want to use it for light work, or for moving toys around. This is why it is ideal for young children. It is not the right wheelbarrow for heavy work, but when used correctly, it will stand the test of time. This is a bright red wheelbarrow that will excite any child. It is small in size for easy maneuvering, especially for outdoor play. 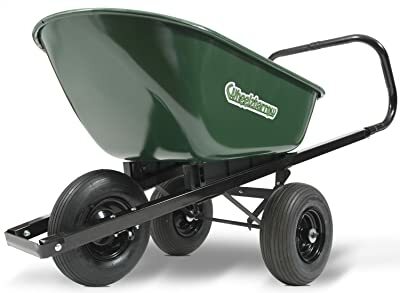 It is instantly recognizable as it has a traditional wheelbarrow shape, featuring one solid rubber tire and hardwood handles. This wheelbarrow features poly ball hearings wheel which can bear plenty of weight. There is also a high density poly tray that is both lightweight and corrosion proof. It is sturdy, and its small size makes it safe for children to handle. Solid rubber tires with smooth rolling ball bearings. Steel front tray braces help keep it stable. Made with hardwood hands so that it lasts longer. Color tends to fade over time. For a wheelbarrow that looks traditional, and woks like something modern, this is the ideal choice for your young one. It also has an adult version, making a little one feel as though they have an adult piece of equipment. That is what makes this wheelbarrow a favorite. This review features the best wheelbarrow brands that you will find in the market. 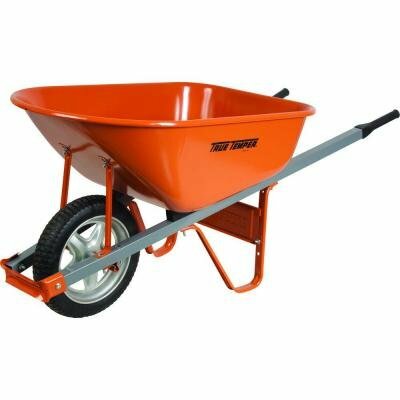 Worx prepares multi-functional wheelbarrows, that are a wise purchase. With these wheelbarrows, you do not need to buy a large amount of other equipment. 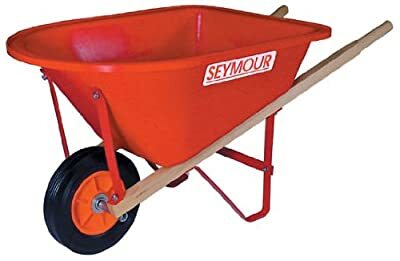 Seymour creates modern wheelbarrows, by making use of corrosion free materials that are lightweight and easy to handle. Taking guidance from traditional designs, the wheelbarrows from this brand are great for people of all ages. Radio Flyer produces quality products from materials that are safe enough to use for children. Safe materials mean less accidents and a reliable end product. Ames is a brand that has stood the test of time, having been in the market for more than two centuries. The designs from this company have one main focus. That focus is making gardening as simple as possible. That is why these wheelbarrows are specially crafted to fit within one’s lifestyle. Wheelzbarrow has created a revolutionary wheelbarrow, and as a brand, looks to provide solutions. In this review, their excellent three wheel wheelbarrow has amazing stability and lasts long. It offers incredible value, and stability that is difficult to match. Lifetime produce wheelbarrows that look great, and have features that are modern and practical. The wheelbarrow here is made from recycled material, a feature that no other wheelbarrow on this list can claim. Jackson also produce quality wheelbarrows, that are given as many features as possible to become more durable. By using the best quality steel, and including leg shoes, these wheelbarrows are durable as well as sturdy and balanced. When looking for your next wheelbarrow purchase, there are several things that you should jeep in mine. First, consider the tire distribution. The more tires the wheelbarrow has, the better stability that you can expect. This makes it easier to handle heavier loads. Also consider the load tray material. Typically, you will find that there are plastic, metal or wood. If you want to ensure that you can carry a heavy load, then look for materials that are much heavier as well. To prevent injury, ensure that you purchase a wheelbarrow that has excellent grips. These should ideally be ribbed, and a fantastic non-slip material is rubber. With this material, even in adverse weather conditions, you will be able to control your wheelbarrow without worrying that it will slip. Finally, check and confirm whether your wheelbarrow has a warranty. This is a strong indication that your wheelbarrow will stand the test of time. It also reveals that the materials used are of exceptional quality, and free from defects. You can trust this type of product to deliver the results that you expect.